Why type when you can talk? Why read when you can listen? Record and send voice messages using your regular email. 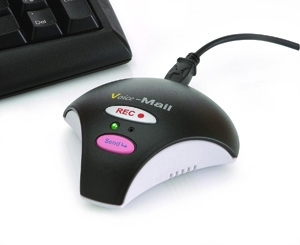 Simply record your message and an email window will automatically open up for you to send it. It is quicker and more personal than typing an email and sending it. It can be received and listened to by the individual on the receiving end of the voice message. Each unit measures 3 1/2" X 3 1/2" X 3/4" and comes with easy to operate software that is easy to download and plugs into a USB port. The audio message is compressed to a mp3 format to reduce file size and maintain high sound quality.. The custom imprint area on the device is 1 1/2" X 1" and the minimum imprintable quantity is 50.